Discussion in 'Foodie's Corner' started by AbbysMom, Jan 1, 2019. Mexican food. I could eat Mexican food or pizza 24/7. orange&white and Furballsmom purraised this. I could eat pizza 24/7. I really don't care for Mexican food. Right now I am eating a tomato sandwich with mayo. Kat0121, orange&white and artiemom purraised this. My sweet tooth is talking to me too, anything sweet, but I don't feel like cooking anything else today. I may just make a cup of hot chocolate for dessert here in a bit. Tomorrow maybe I'll make some chocolate chip cookies or brownies. miagi's_mommy and Furballsmom purraised this. An omelet with really good home fries sounds good right about now. Furballsmom, miagi's_mommy and orange&white purraised this. miagi's_mommy and orange&white purraised this. Wow, everything sounds good, guys! With me, it's coconut. I'm dying for anything with coconut. My craving hit hard two days ago so I headed to Friday’s for my all time favorite meal. A pecan crusted chicken salad. It has romaine lettuce, cranberries, celery, citrus sliced, pecans and chicken in a balsamic dressing. Still craving it so I may bring one home for dinner tomorrow. orange&white and artiemom purraised this. I've been craving oranges a lot lately. And also chocolate. I have also been craving oranges this past week. I usually don't eat them because they are so messy but I will have to get some when I go to the store. I just searched a bunch of "breakfast cornbread" recipes and am about to make some sausage-cheddar-onion cornbread muffins to freeze and take work for breakfasts this week. susanm9006 and miagi's_mommy purraised this. 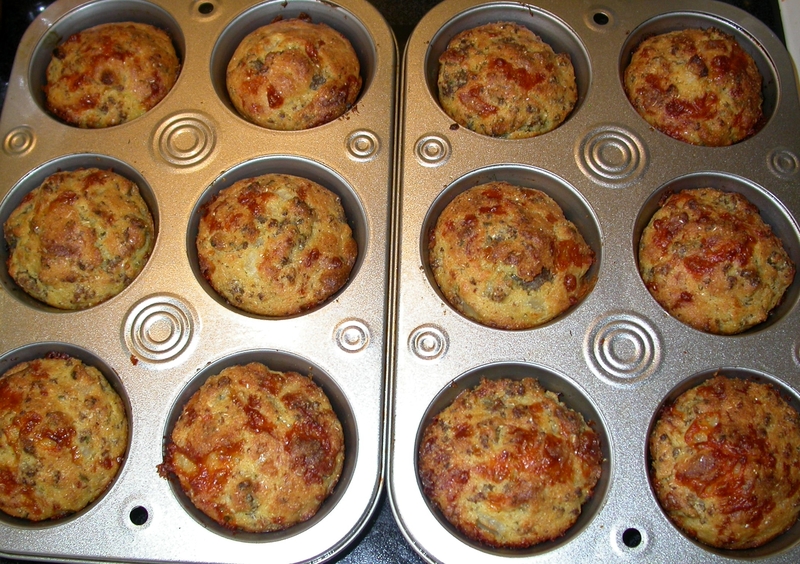 am about to make some sausage-cheddar-onion cornbread muffins to freeze and take work for breakfasts this week. They taste very good, but came out a little dense and flat...think I need a fresh can of baking powder. I'll probably also note to make 8-10 muffins instead of a dozen and put more batter in each tin next time. Anyway, fixed my cornbread craving for a while. Winchester and artiemom purraised this. Oh! Bacon sounds good. Can you get coconut bacon? Just asking.